Your doctor or physiotherapist will tell you when you can start these exercises and which ones will work best for you. Tighten your belly muscles and buttocks, and press your lower back to the floor. Keeping your knees bent, lift and then lower one leg up off the floor, and then lift and lower your other leg like you are marching. Each time you lift your leg, hold that position for about 6 seconds before lowering your leg. 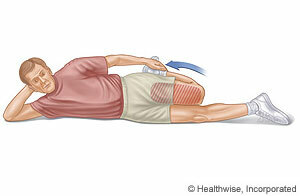 Lie on your back with your knees bent at a 90-degree angle and your feet off the floor. Slowly straighten one leg, and hold that position for about 6 seconds. Your leg should be about 30 centimetres off the floor. Bring that leg back to the starting position, and then straighten your other leg. Hold that position for about 6 seconds, and then switch legs again. Lie flat on your back with your legs straight. If you feel discomfort in your back, place a small towel roll under your lower back. Holding the back of your affected leg for support, lift your leg straight up and toward your body until you feel a stretch at the back of your thigh. Hold the stretch for at least 30 seconds. Lie on your side with your good leg flat on the floor and your hand supporting your head. Bend your top leg, and reach behind you to grab the front of that foot or ankle with your other hand. Stretch your leg back by pulling your foot toward your buttock. You will feel the stretch in the front of your thigh. If this causes stress on your knee, do not do this stretch. Hold the stretch for at least 15 to 30 seconds. Kneel on your affected leg and bend your good leg out in front of you, with that foot flat on the floor. If you feel discomfort in the front of your knee, place a towel under your knee. Keeping your back straight, slowly push your hips forward until you feel a stretch in the upper thigh of your back leg and hip. Lie flat on your back on a table or flat bench, with your knees and lower legs hanging off the edge of the table. Grab your good leg at the knee, and pull that knee back toward your chest. Relax your affected leg and let it hang down toward the floor until you feel a stretch in the upper thigh of your affected leg and hip. Enter Y830 in the search box to learn more about "Hip Flexor Strain: Rehab Exercises".